Retire Well In Mexico? More and more senior citizens from the US and Canada are choosing Mexico to spend their retired life. Are you still wondering why people prefer Mexico? Read on to understand the reasons. These retiring in Mexico tips are brought to you by the Mexican Insurance Store.com, purveyors of Top Rated Mexican Auto insurance which is easy and convenient to buy Mexican Auto insurance online at rates you can afford! For more details about Mexican Auto insurance and retiring in Mexico read the news releases about Mexican Car Insurance Online or Mexico Insurance at http://mexicaninsurancestore.com today! For low cost rates and high quality Mexican Auto insurance or to read interesting articles about Mexico visit Mexico insurance at Mexican Insurance Store.com. Mexican Car Insurance Online is now required in order to drive on any highway in Mexico. After retirement, people tend to arrange their living based on a defined sum of money which will probably not increase in near future. Therefore, the cost of living is the top most priority for retirees and in Mexico the cost of living is much high as compared to Canada and America. San Miguel de Allende is one of the many cities in Mexico that is preferred by retirees. Besides lower housing costs, city property taxes are also very low as well. Some people think that in Mexico they would not get modern facilities and luxury they are enjoying in Canada. However, the fact is Mexico is among the most visited countries in the world. Cities such as Cancun, Cuernavaca, Mexicali and Matamoros are the best examples of modernity in Mexico. Mexico is a big country and features a wide range of climatic conditions. Retirees from the US and Canada are looking at Ajijic, San Miguel de Allende and Cuernavaca because you will find similar weather all the year round. Cancun and Acapulco who wish to live a life full of refreshing natural treats. Beautiful landscapes are an integral part of Mexico. In the central plateau, you will find cascades of mountains with lush vegetation, high desert and lakes. The coasts are full of exquisite beaches and while traveling towards the south, ancient ruins and jungles will come your way. Finding domestic help in Canada or US is not an easy or inexpensive task. But in Mexico, you can easily find good domestic help at reasonable cost. This is one major reason why retirees prefer Mexico as good domestic help is very affordable even on tight budgets. You can get domestic help on part time basis as well. Rich culture and traditions in Mexico are not worth missing and Mexican people are very friendly. Even in this modern seemingly uncaring world, they will approach you, let you learn about their culture and would love to know about yours as well. 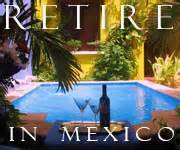 Retire Well In Mexico? Mexican Auto insurance at http://mexicaninsurancestore.com comes with FREE Roadside Assistance. I have a few friends who have decided to stay in Mexico during their retirement years. I am considering myself to join them; after all Mexican items are much cheaper including the Mexican auto insurance. Previous post: Sport Fishing Tourneys in Mexico Pay Big Prize Money ! Next post: Mexico Colonial Sites, Walk Back To The Future!